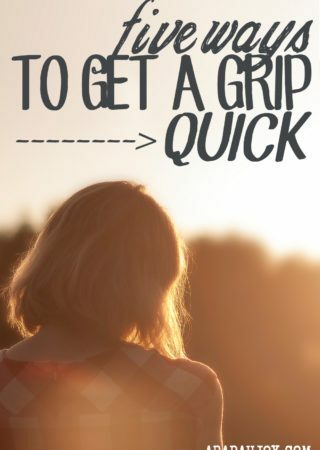 5 Ways to Get A Grip Quick! Do you remember Dumbo’s magic feather? Dumbo lacked confidence in his ability to fly; so his friend Timothy “tricked” him into believing the feather was magic. When he held it in his trunk, Dumbo believed he could fly. God wants us to be confident in our ability to master our emotions. Just think of all the Scriptures that encourage us to believe we can live self controlled and sober minded, to consider ourselves dead to sin and alive to God, that it is possible to be angry and yet not sin. God’s Word exhorts us to live from our new nature and experience emotions such as compassion and tender hearted-ness, to live vulnerable and meek, to express the heart of God through our emotions. This really is a beautiful and wonderful possibility. Dumbo’s story is make believe, but we have everything we need to live self-controlled in our emotions and at the same time be passionate, fervent, and influential in love and service. In other words, we aren’t to be bossed and badgered by fleshly or even demonic emotions. But here’s the deciding factor: this involves making a choice. We must believe God has something better for us and then step out and act in faith. While God’s Word doesn’t provide “magic feathers,” it does give ample instruction on how we can keep our emotions in check. By doing these things, we are taking a step of faith and choosing to bring our emotions under the authority of Christ. One of the actions that characterized the virtuous woman of Proverbs 31 was SMILING. I don’t know that this came naturally to her… I believe it was a choice. Think about it. She wasn’t born virtuous. 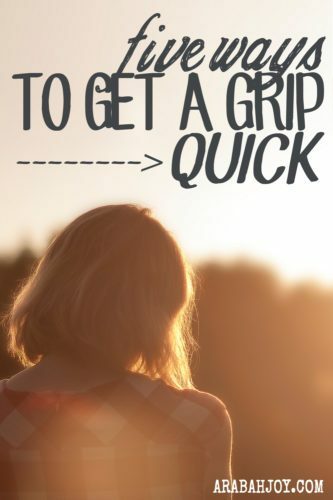 A friend told me once that she frequently found herself impatient and frustrated with her children. She decided on a plan of action: she would just start smiling when she felt those emotions. The result? It changed everything! There is something about smiling that softens the face as well as the heart. The virtuous woman is the one who chooses to smile. Instead of fret or self-protect or speak in anger. When Saul was tormented by evil spirits he called for music. Music has the ability to both evoke and soothe emotions. The Psalms provide rich insight into how music was used to calm fears, dispel depression, renew hope, and teach theology. Singing is a great way to regulate the emotions. Choose a few “go-to” songs appropriate for your emotions. For example, when I recognize anxiety, one of my favorite songs to sing quietly is “Be Still My Soul.” Music doesn’t have to be loud or well done to be powerful~ smile! It is said that Susanna Wesley, mother of nineteen children including John and Charles, would pull her apron over her head when she needed time with God. When her children saw the apron go over her head, they knew to leave her alone! Making time to pray and meet with God is essential for every believer. As moms, we may not be able to have an hour long quiet time each day or even have a few minutes alone; but we need to creatively make provision to regularly meet with God throughout the day. I imagine when Susanna’s emotions began to overtake her is when she would throw the apron over her head. Let emotions be the signal to pray. What can you do to take prayer breaks during your day? Our culture tells us that to really be happy we must take vacations, serve ourselves, and act on every selfish whim we have. If we don’t do these things, we will be deprived and worn out. So they say. But Scripture teaches that we are blessed when we serve. There are clear emotional benefits to serving others. In the moment that emotions begin to cause inner turmoil, try asking, “How can I serve the person in front of me?” Make this a habit and see how God honors this step of faith. When we choose to move our minds from our circumstances and feelings to the character of God, He takes it personal. He is looking for people who do this so He can show Himself strong on their behalf. We give honor to what we magnify. When we magnify our problems or feelings, we rob God of His honor. But when we acknowledge God, we magnify and honor Him and our emotions begin to reflect the greatness of God. Another easy way to acknowledge God is by using the A-B-C’s. For each letter of the alphabet, name an attribute of God. Meditating on God’s nature reaps incredible emotional benefits! This is one of the exercises I discuss in my eBook Complete. There you have it: your rescue pack for getting a grip on your emotions. Now take a few minutes to plan what you will do… then work your plan. Share your plan in the comments? We’d love to hear! This is sooo good!!! I’ve been in the heat of this battle right here today on our place of waiting and have been using these methods. Just hadn’t named them, like a list! The smile one is so simple and yet profound. I’m loving this series and have forwarded it to my Women’s Ministry email list. Hope they subscribed! Praying for much fruit from your words and your travel time. My 4 year old has a scripture song CD and they sing a song called, “Be self-controlled, Be self=controlled and alert. Your enemy, the devil, prowls like a roaring lion, seeking for someone to devour.” So, when I feel myself about to yell at my children, I try to remember to sing it. I have also told my son to say “Be self-controlled and alert, Mommy,” whenever he notices me getting mad or yelling. God is good!! By His power only, I can stop being a yelling, over-reacting mom. Thanks for this post. You have given me the tools to begin to get a grip on my emotions. Thank you. Holy Spirit…,help me to apply this to become a way of life . Baby steps :) In Jesus Name amen! These are great! I especially like 4 & 5. Remembering God’s character is something I’m trying to do more and more. So thankful for you! Very well done! I liked the reminder. Thank you for sharing. What a great article! I especially like the one on smiling. As Kathy Schwanke said, so simple, yet so profound. I also like Proverbs 15:1: “A soft answer turns away wrath.” I used to think it was about turning away someone else’s anger. And I think it is. But I think it also helps us calm ourselves down. Shouting is only bound to escalate anger or negative emotions. But I sure wish I’d known about the smiling one when my kids were little! Thanks for sharing! I have to admit, AJ, that emotion tends to be a weak area for me, or at least I feel weak there. But, I have been learning more and more to not let them reign over me, but to take them to the Lord instead. I have found that listening to Christian radio really helps lift a grumpy mood in the house, not just for me, but for my family, too. Great advice! I tried the ABC’s just because and found myself weeping half way through. I could barely finish, my heart leapt so hard. It was a true jump start. Jesus is Lord. Thank you!